Home from New York! - I bet you think this blog is about you. And pretty sure I didn't leave my favorite pair of pants behind in a hotel? Back from Connecticut and New York! Actually I was back a week ago, but then I had a two-day local conference, and a weekend chock full of social events. Here we are, though. Despite being back a week, I just got to the laundry tonight, and still have work work to finish so I'll only recount one adventure for now. Two Tuesdays ago I got on a very cheap JetBlue flight to Hartford, stopped at a Sonic* for greasy food I can't get in DC, then off to a random suburban hotel for the night. In the morning I made it out to the Connecticut State Capitol, number 11 on my quest to see them all. It was very busy, by far the nuttiest one so far. In addition to multiple people lobbying both for and against another casino license in the state, it was Polish Day! Great chaos all around. But the real adventure came after that. My duty was to return my rental car to the location listed as the Bridgeport Holiday Inn, then haul myself and my luggage to the adjacent Amtrak station for my train into New York. Despite having an excellent GPS, I drove right by the hotel with no clue where to drop off. So after a minor circuit of downtown Bridgeport** I pulled back into the front driveway and parked, now desperately seeking both a men's room and then someone to assist. The hotel was hosting either a 50th or 60th anniversary party, whichever year starts parties at 3:30 in the afternoon. :) So I politely moseyed past their overflowing buffet line to the restroom, then back. The hotel staff pointed me to the little rental car office, which was helpfully dark and locked up tight. Not a great start. Next I went out the back door and finally saw the parking garage with a big "Hertz returns here" sign. Good start! I drove the car in there, but with no staff in sight I drove up seven levels in vain before finally calling the little office. Fortunately someone picked up, and his instructions were "park in any open garage space, note the mileage, and bring the keys into our little office inside the hotel." Sounds easy enough, right? Except the 60th anniversary guests were still pouring into the garage and there was scarcely enough room for traffic in the opposite direction. So I had a fun 12-minute crawl back down to the basement level where there were blessed open spaces. And that is where I left my Mazda 3 and enjoyed not being in charge of a motor vehicle for a week. If I can give you any advice at all, it would be don't return your rental cars to the Bridgeport Holiday Inn. The return man (who was in fact in the office upon my return) was very nice, though. *Eventually I will visit one of these in every state, too. A true American dream. **Which was not treated well by urban renewal and the 60s/70s/80s in general! Yow. I hope they can replace some of that concrete with green stuff eventually. And the lovely old downtowns built on river valleys with enormous decked freeways rammed right through the middle were just depressing. Do better, Connecticut. 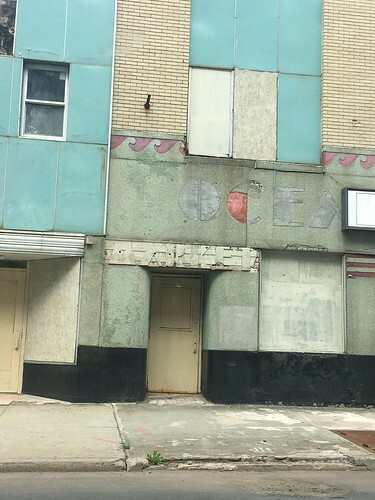 ETA: Here is a snap I got in downtown Bridgeport, of what was clearly a very interesting building at one point. But is unlikely to be again without some intervention! The tater tots are excellent! Made even better by only having them twice a year.